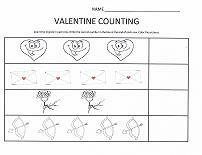 Valentine worksheets will keep kids engaged in learning. Bright colors and Valentine symbols can be used to teach a wide variety of skills. Use the following worksheets to during the holiday time to keep kids engaged and help teach patterns, counting, writing numbers, letter sounds, the concepts of big and small and scissor skills. 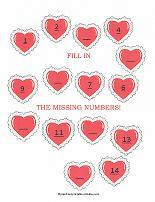 Teach the concept of patterns with this fun Valentine cut and paste activity. 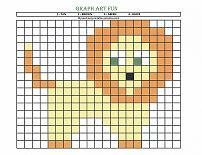 Cut out the six pictures at the bottom of the page and paste in the correct box to continue the pattern in each row. Teaching letters and their sounds? Each of the Valentine items begins with one of the letters at the bottom of the page. Have the children write the correct letter in the box below each picture. 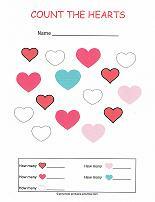 A simple counting sheet made fun with many colors of hearts. Have the children count "how many" of each color, and write the correct number in the box at the bottom of the page. Lots of hearts on this page numbered one through fifteen. Oops... some of the hearts are missing their numbers. Have children fill in the missing numbers. Teaching the concept of big and small is easier if the objects are side-by-side. 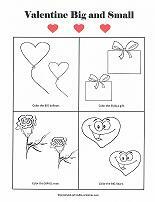 Each of the four boxes in this worksheet asks the children to color either the big or small Valentine item. 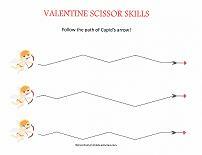 This worksheet is perfect for little ones who are just learning to use scissors. Have them cut on the line to follow Cupid's arrow. This simple but fun worksheet helps reinforce counting skills. Simply count the Valentine items in each row and write the correct number in the box at the end of each row. Printable Valentine Cards – Some are “just right” for children’s Valentine exchanges, others are perfect for children to give to the important adults in their lives. Valentine’s Day Games – Print now for immediate play. Choose tic-tac-toe, word-find, dice game, Sudoku or assorted match games.